Human Teeth Jewelry: Creepy or Cool? For Australian silversmith Polly van der Glas, diamonds aren’t a girl’s best friend; she prefers to raid the Tooth Fairy’s war chest for dendrites in the rough, which she sterilizes and then hand-sets in sterling silver. From solid canine-encrusted signet rings to delicate molar-embellished earrings, these toothy trinkets are a quirky take on recycled jewelry—and our idea of luxury gems. So what do you think? Champing at the bit for your own fanged finery or avoiding like the plaque…um…plague? Can we go with creepy cool? Does anyone know how much these are please?? For Australian silversmith Polly van der Glas, diamonds aren't a girl's best friend; she prefers to raid the Tooth Fairy's war chest for dendrites in the rough, which she sterilizes and then hand-sets in sterling silver. 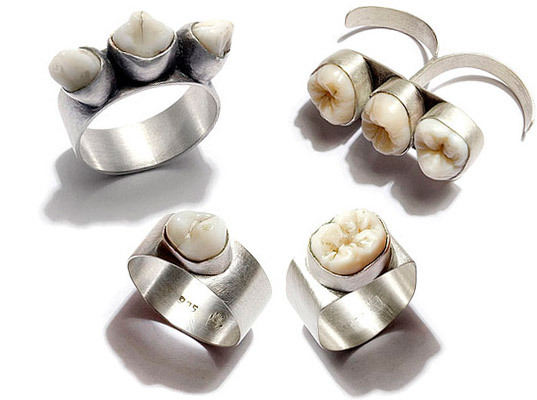 From solid canine-encrusted signet rings to delicate molar-embellished earrings, these toothy trinkets are a quirky take on recycled jewelry�and our idea of luxury gems. So what do you think? Champing at the bit for your own fanged finery or avoiding like the plaque...um...plague?